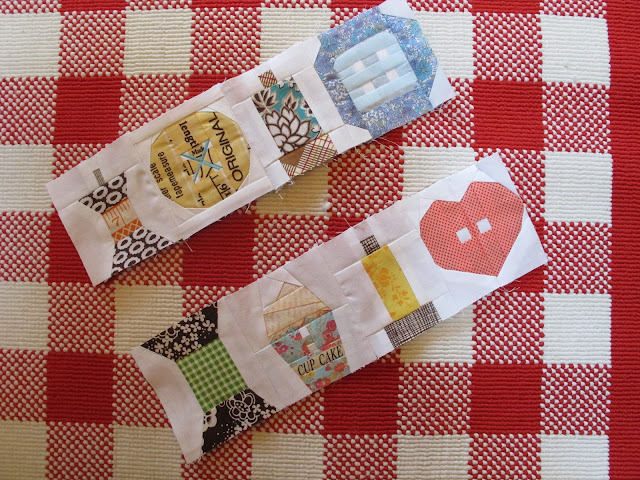 Penny and I always like to make a project with our Sew-Ichgio blocks to give you a little creative kick start that you can either do yourself or use as a springboard for your own ideas. 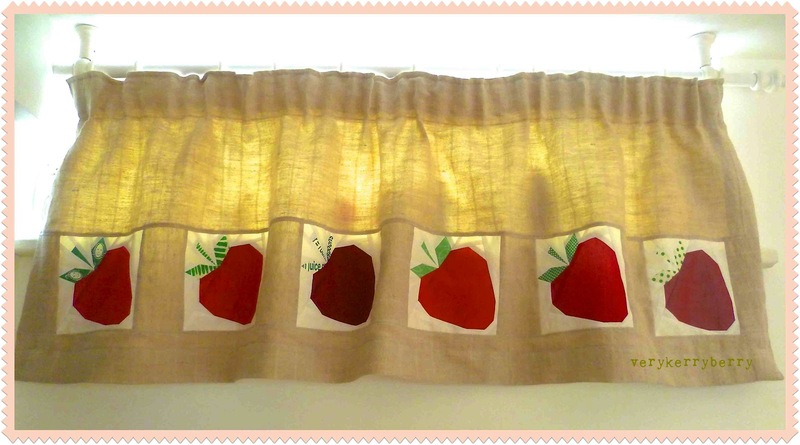 With my latest pattern, Strawberry-Ichigo, I made a curtain for a skinny window in my kitchen. The I chose six shades from the Oakshott Ruby Reds range to show different stages of ripening. I kept the block to the standard 6" finished size and added sashing (3 1/2" x 6 1/2") between the blocks before adding a strip below and the main block of linen above. From then on, I made it as a standard curtain. I am no expert, in fact I loathe making large curtains, so I pull it together in a fairly random way. It is a small curtain so I can get away with some slip shod ways! If you want to do a more professional job there is a great list of tutorials here. I tread a fine line in my little house between covering every surface in patchwork/quilty items and restraint, so I thought you might like a quick tour around the craftiness in my kitchen- who doesn't like a poke around other people's houses? My blind was a standard roller to which I added a little Alexander Henry fabric trim. It was harder to do than I imagined , that long seam n fabric that cant be squished or folded meant I had to sit the sewing machine in the middle of a room to make it work. My Teapot Fancy cosy gets used twice a day when I make a proper loose leaf pot. I like a strong Earl Grey, especially first thing in the morning- although a little delicate green jasmine tea is in the vintage cup and saucer below. I love my turquoise work top! Here is a morning brew in a giant mug and sitting on top of a runner made from a little bee group where we made blocks from Kumiko Fujita's 318 Patchwork book. The little boxes next to the mug store the many phone/ipad chargers! I have more goodies from friends. Under the tongs and whisk you can see a beautiful potholder made by Megan when we did a little swap last year- perfect colours and foodie fabrics. And hiding on a vintage cup rack- an oven hand mit from Penny which sees regular usage- love that peep of binding. Hope you enjoyed your tour! 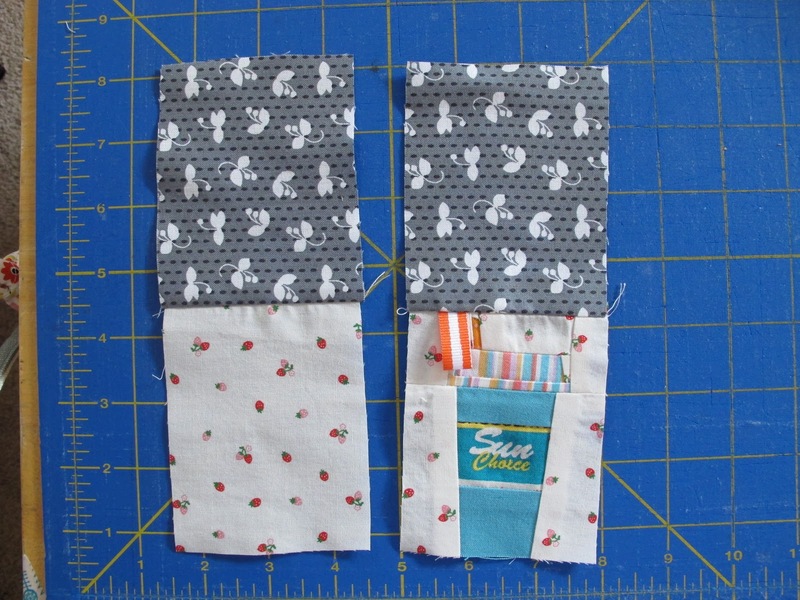 We are just working on a little back to school set, ready very soon- sneak peek of Penny's design here! 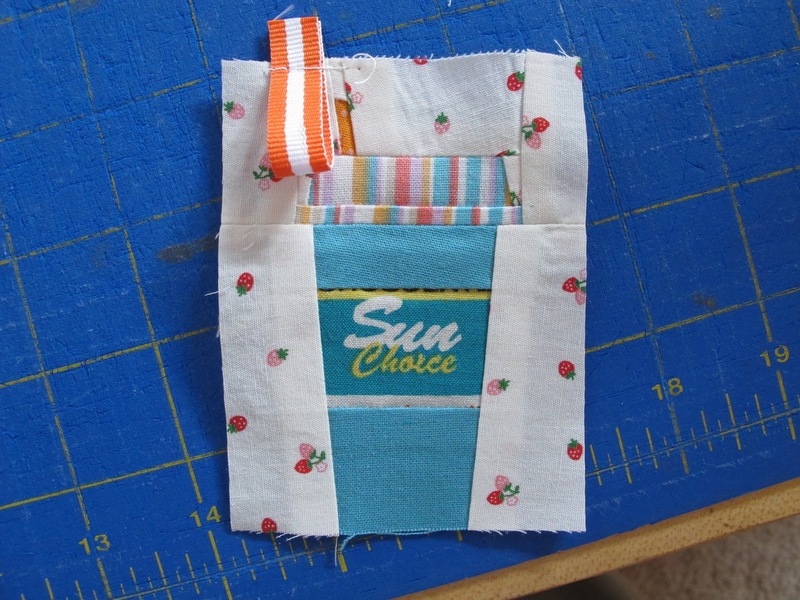 One of the things I love about sewing is making something functional and aesthetic from fabric. The Latte to Go pattern seemed to beg me to become a mug rug and since coffee house gift cards are always a welcome treat when I receive them (go figure! ), I thought a nice gift card sleeve was in order as well. Together, they create a perfect little thoughtful gift! Another idea. 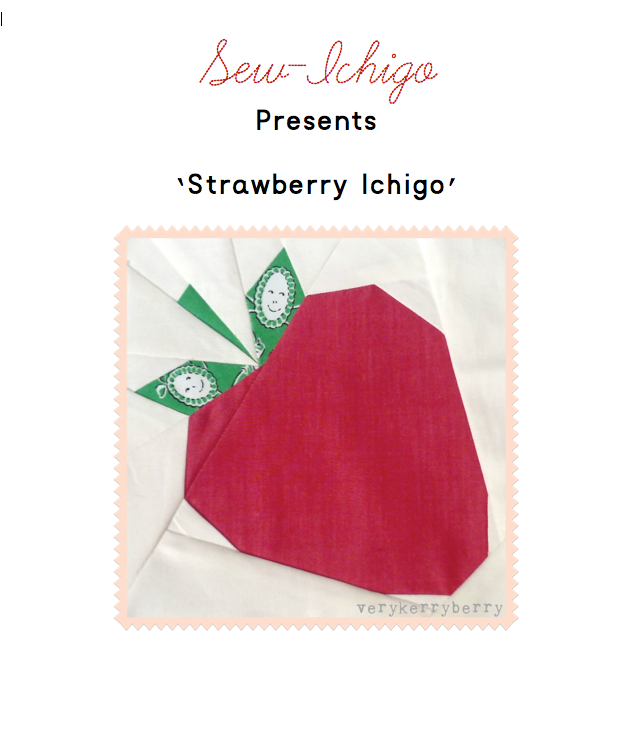 If the person you are making the mug rug/gift card sleeve for doesn't drink coffee, put a Strawberry Ichigo on it instead! (both the Latte to Go and Strawberry Ichigo finish at 6" square, 6.5" unfinished). Wouldn't that be cute? Along with a gift card to the local kitchen shop and you have the perfect gift for the cooking connoisseur in your life. Note: all seams are 1/4" for each project. What you need: a completed Latte to go block, 8" square of batting, 8" square of backing fabric, binding fabric, grommet. layer the backing right side down, then the batting, then the Latte to Go block right side up and pin and quilt. Trim the excess batting and backing. Using manufacturers directions, apply the grommet to the upper left hand corner of the mug rug. 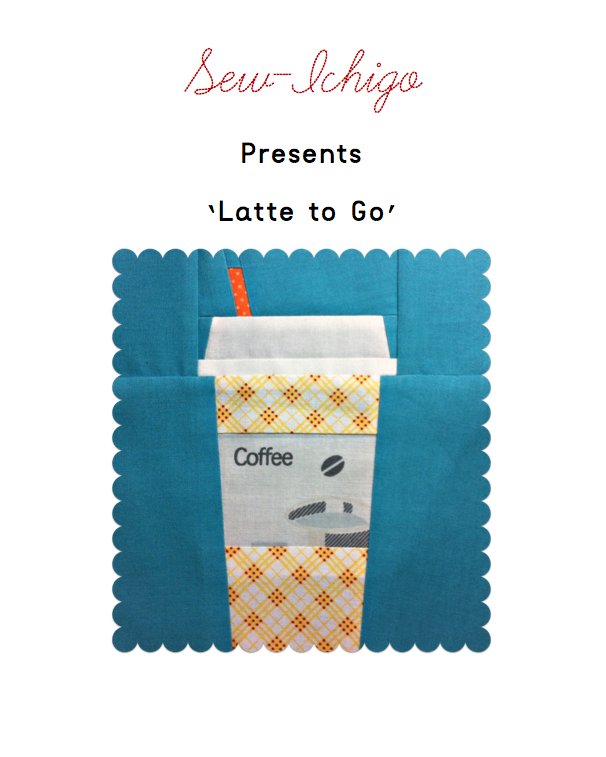 What you need: a completed Latte to Go block (reduce the pattern copy by 50% before making it), 2 pieces of lining fabric and one backing fabric cut to 2 3/4" X 3 1/2", 3" ribbon. 1. Trim 3/8" off each side of the small Latte to Go block. 2. Fold the ribbon in half and stitch it down 1/8" from the edge to the block on the upper left corner, about 1/2"-3/4" from the edge. 3. 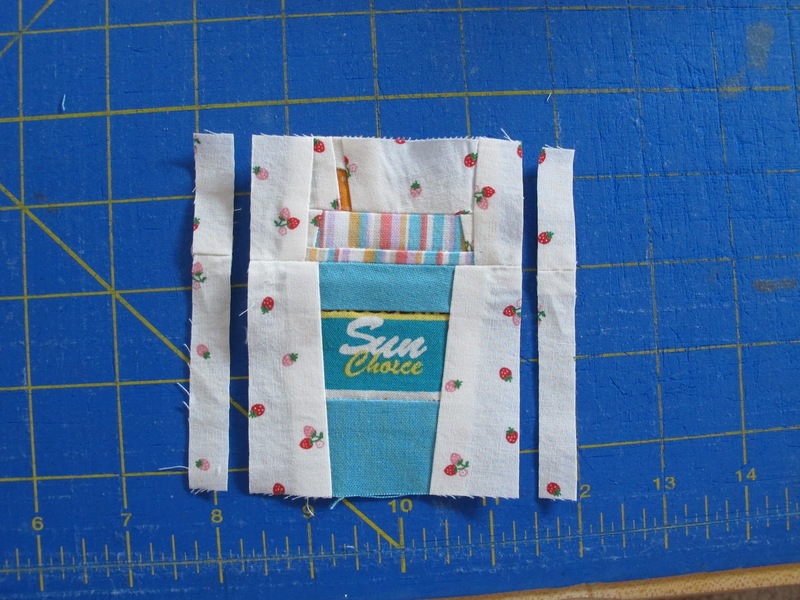 With right sides together, sew the top edge of the block to the top edge of one of the lining pieces. 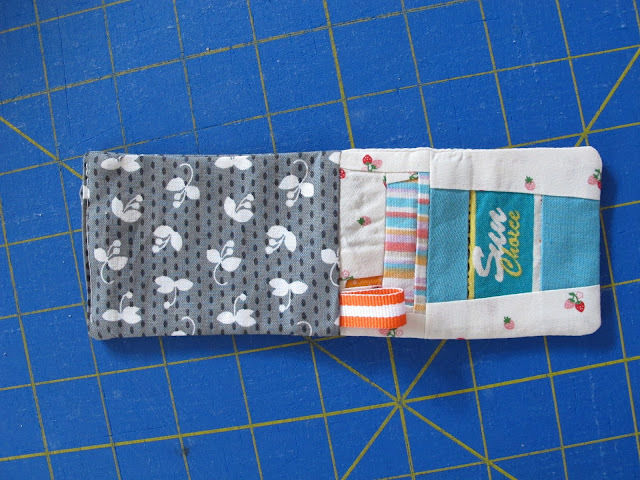 Repeat with the backing fabric and the remaining lining piece. 5. Turn the piece through the opening. Press, then stitch the opening closed. 6. Push the lining down inside the gift card sleeve and press again. 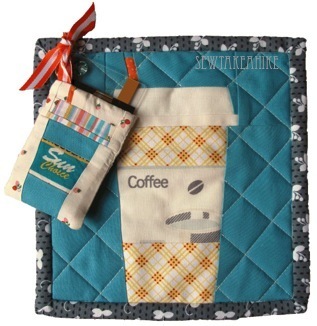 Use a matching ribbon to tie the sleeve to the mug rug, purchase your gift card, and you are ready to give! 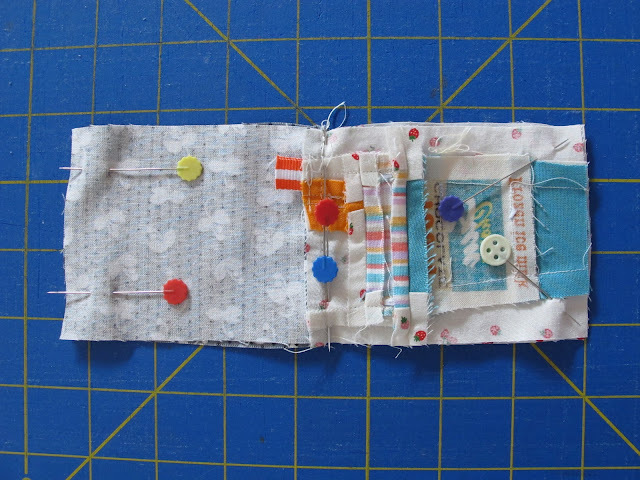 For Kerry and I's latest pattern sets, we decided to use existing tutorials to incorporate the spools and buttons into. Kerry had the brilliant idea of doing a button card with the buttons and then used it to modify and make one of Ayumi's organizer baskets. You can read about the details and the how to that Kerry posted here. 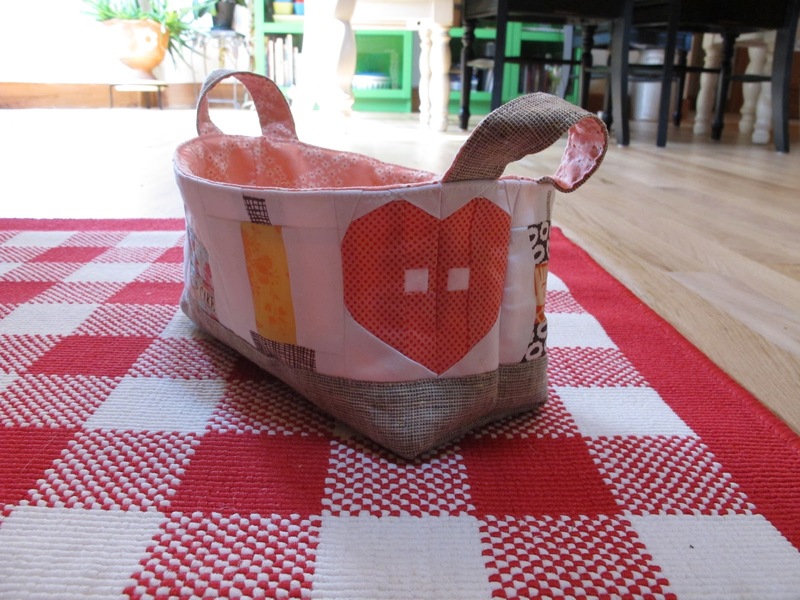 For the spools and button blocks I made, I decided to use them to make one of Ayumi's baskets. The spools and buttons basket ends up slightly larger than the orginal basket of Ayumi's and seems to be a nice size. I thought it was quite funny that as Kerry and I were emailing back and forth about the project each of us would make with our blocks from the Spools and buttons, that we each had decided we would mail our finished baskets to Ayumi before we knew the other was doing the same thing! Choose 4 buttons and 4 spools and make those blocks. Sew 2 buttons and 2 spools together, alternating them so you have a section for the back and a section for the front of the basket. (you will have to trim 1/4" from the top and bottom of each spool so they end up the same height as the button blocks). The front and back section will each be 3 1/2" X 12". cut your linen fabric 6"X12"
cut your batting fabric 12"X12"
cut your lining fabric 12"X12"
When Penny and I design patterns for Sew-Ichigo we always want to think of some practical uses for them. We always put our creations in the Sew-Ichigo Flickr group and we hope you will do the same! For Penny's The Button It pattern I wanted to use them to make a button card to feature in a generously sized tray to store mini projects. I used Ayumi's tray pattern scaled up so I though I would share my measurements in case you wanted to do the same. Firstly I printed the Button It pattern a little smaller so the buttons would be 2 1/2" finished size rather than 3"- set your photocopier at 83% for this. Once I had made 5 buttons using the new Liberty Lifestyle prints and a blank square 3 x 3" of Kona snow, I stamped some fabric with Made in England and Buttons and then sashed them together. There are tips on using stamps here. I did a little extra piecing at the top to get fit the selvedge in but the measurements are the same as below. I used a single strand of embroidery floss to turn the selvedge circles into tiny buttons and 6 strands of floss to make the buttons look as if they were stitched on to the card. My final touch at this stage was to use the 6 strand floss to make a single stitch as if a button was missing from the card. The block was sashed all around with 6" wide strips of Essex yarn dyed linen in flax and I trimmed it down so the button card was at an angle, this measured 16" x 20". I then followed Ayumi's tutorial! I used fusible fleece, Vilene H640 which is the only interfacing I can truly trust not to go wrong! It adds structure and softness and is great for pillows and bags too. 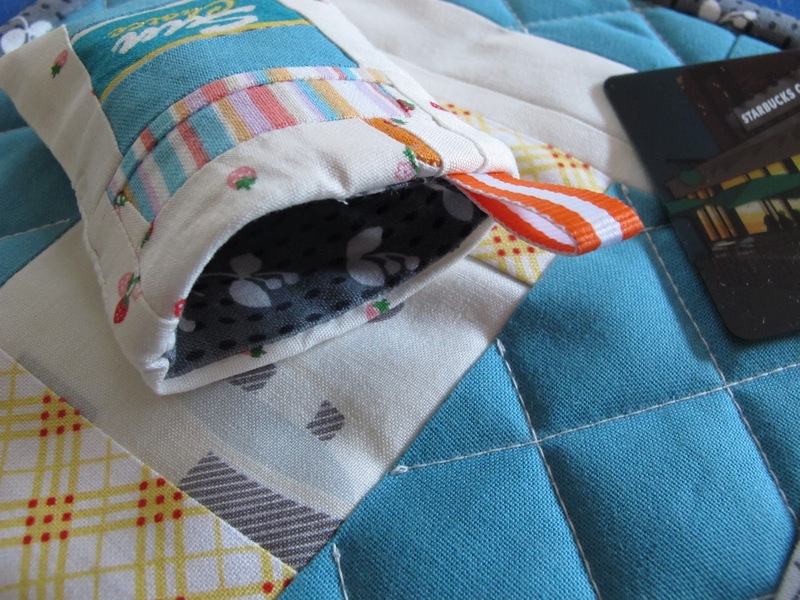 I quilted lightly, just following the sashing seam lines on the button cards and a diamond criss cross on the linen. The gusset measured 8 1/2" but you could change this to have lower sides and a wider base. I top stitched the sides to make it stand up. And then I popped it in the post for Ayumi! It was her birthday present. We can all never have enough storage and Ayumi's tray pattern is so easy to adapt and make a series of trays Russian doll style! 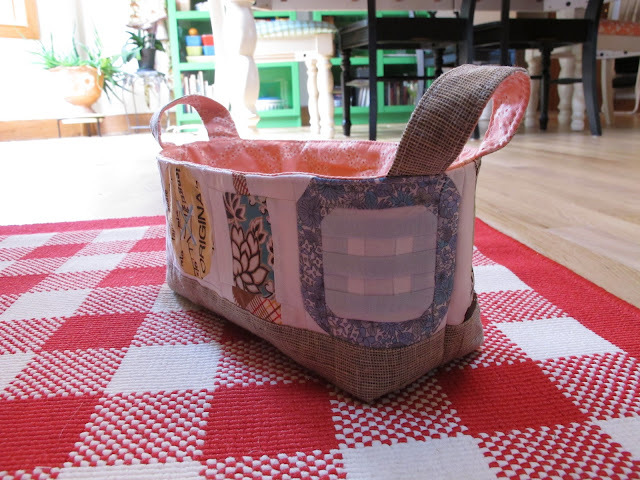 Penny will be sharing another of Ayumi's tutorials; the fabric basket to show you further uses for the patterns and you can buy for 'Button It' and 'Rainbow Rack of Spools' here and here. I am seeing some great ideas coming up in the Flickr group so I fancy sharing a gallery of those soon too!